As part of the week-long Homecoming festivities, San Jose State University hosted an inaugural golf cart parade on Wednesday, Oct. 4 as an opportunity for Spartans to show their pride. 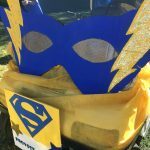 The Office of the Provost Office staff members decorated a cart and donned superhero capes in Spartan gold and blue. The parade participants included student organizations, athletes, cheerleaders and campus departments. The Spartan football team will compete against Fresno State on Oct. 7, at 4:30 p.m. in CEFCU Stadium. 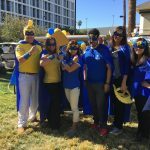 Provost Andy Feinstein, far left, donned superhero attire with his office staff as part of SJSU’s first homecoming golf cart parade. The Provost Office used a superhero theme for their golf cart in the Homecoming Parade. The Student Services Center (SSC) is celebrating our Spartans by hosting our sixth annual Open House. Come enjoy refreshments, meet the staff and learn more about how the SSC serves over 120,000 students and prospective students each year. Play games to discover the amazing departments that are housed in the SSC and meet Sammy! Prizes, food and fun! 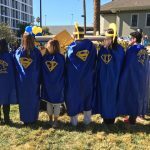 Associated Students continues the homecoming tradition at SJSU with the annual Fire on the Fountain Homecoming celebration. The event begins at 4pm with free food, student organization activities, and performances. The pep rally ignites later at 8pm with fire dancers, athletics, and homecoming royalty. Welcome back to another exciting year at San Jose State University. I hope all of you enjoyed the summer and are ready for the start of the fall semester. Our top priority this year will continue to be student success. President Papazian is committed to improving graduation and retention rates, and enhancing the student experience at SJSU. She brings with her a strong background in developing strategies to assist in such efforts. She is supportive of the work we’ve undertaken and I’m confident she will provide enthusiastic leadership as we move forward. Over the summer, Academic Affairs and Student Affairs leadership hosted a productive joint retreat in which we solidified our partnership, began refining SJSU’s Four Pillars of Student Success Plan and developed an implementation strategy for key priorities this fall. This plan will guide us as we continue to work toward improving graduation and retention rates. SJSU remains committed to contributing to the CSU Graduation Initiative 2025. The Chancellor’s Office has revised targets for each campus, with San Jose State’s goal for first-time, first-year student four-year graduation rates set at 35 percent. It is an ambitious goal, but with all of us working together, it is certainly achievable. We will also be working to eliminate our graduation gap between students who are underrepresented minorities or Pell grant eligible and their peers. More information and other target goals are available on the Provost website. Our campus is fortunate to be one of the first pilot institutions involved in a new CSU Student Success Dashboard — Faculty Matter — developed by the Chancellor’s Office. The dashboard is a tool to help faculty, staff, and administrators better understand our students. It includes college and department specific information about student demographics, progress to degree, course pass rates and other information that we can use to further support and enhance student success. As part of our college readiness efforts, I will be co-leading a Student Success Summit on Sept. 30 to explore ways we can work with our K-12 and community college partners, and legislative leaders, to improve graduation and retention rates. While most of the day’s events will be closed to the public, the general campus is invited to hear Martha Kanter, former under secretary of the U.S. Department of Education and a former chancellor for the Foothill-DeAnza Community College District, give a keynote speech from 8 to 9 a.m. in Student Union Room 1. In addition, SJSU is honored to host the 19th Annual CSU Teaching and Learning Symposium on Oct. 21 and 22. The theme this year is “Promoting Student Success through Innovation, Creativity, Diversity and Teamwork.” For more information on the symposium, visit the Center for Faculty Development website. As we focus on student success, we will also continue to provide research, scholarship and creative activity support and professional development for faculty and staff. We have a plan in place that aims to increase RSCA opportunities for faculty and students. We will also continue to offer professional development grants for staff, with a call for proposals due out soon. I appreciate having all of you as partners in this vitally important work.